(CNSNews.com) - In fiscal 2017, real Social Security Administration spending topped $1 trillion for the first time, according data published in the Monthly Treasury Statement. The Social Security Administration spent a total $1,000,812,000,000 in fiscal 2017, according to the Treasury. 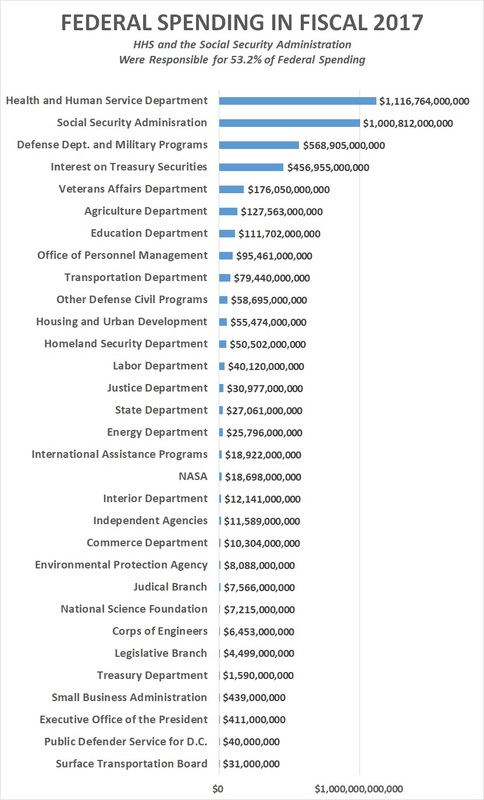 That was about 37 times as much as the Department of State spent during the year ($27,061,000,000), 32 times as much as the Department of Justice ($30,977,000,000), and 20 times as much as the Department of Homeland Security ($50,502,000,000). The $1,000,812,000,000 spent by the Social Security Administration in fiscal 2017 was also about 76 percent more than the federal government spent on Department of Defense and Military Programs ($568,905,000,000) during the year. According to the Monthly Treasury Statement, the only major spending category that absorbed more money than the Social Security Administration in fiscal 2017 was the Department of Health and Human Services, which spent $1,116,764,000,000. The combined $2,117,576,000,000 that the federal government spent on HHS and the Social Security Administration in fiscal 2017 equaled 53.2 percent of the $3,980,605,000,000 in total federal spending for the year. Real Social Security Administration spending first topped $600 billion in fiscal 1997. It then topped $700 billion in 2006, $800 billion in 2009 and $900 billion in 2013. The record $1,000,812,000,000 that the Social Security Administration spent in fiscal 2017, as reported in the Monthly Treasury Statement, encompassed both the Social Security program itself (which includes Old-Age and Survivors Insurance and Disability Insurance) and the Supplemental Security Income Program. The latter is administered by the Social Security Administration but is funded by general federal tax revenues. As reported in Table 5 of the September Monthly Treasury Statement, the SSA spent $791,098,000,000 on benefit payments from the Old-Age and Survivors Insurance Trust Fund in fiscal 2017. It also spent $3,678,000,000 in administrative expenses for that fund and paid $4,316,000,000 to the Railroad Retirement Account. The SSA also spent, as reported on Table 5, $142,957,000,000 on benefit payments from the Disability Insurance Trust Fund and $2,692,000,000 in administrative expenses for that fund. The SSA also spent $58,710,000,000 on the Supplemental Security Income Program in fiscal 2017, according to the report. In a statement to CNSNews.com, the Social Security Administration acknowledged that the combined spending for the Social Security program (Old Age and Survivors Insurance and Disability Insurance) and the Supplemental Security Income program did exceed $1 trillion in fiscal 2017, but that spending for the Social Security program alone did not reach that level during the year. 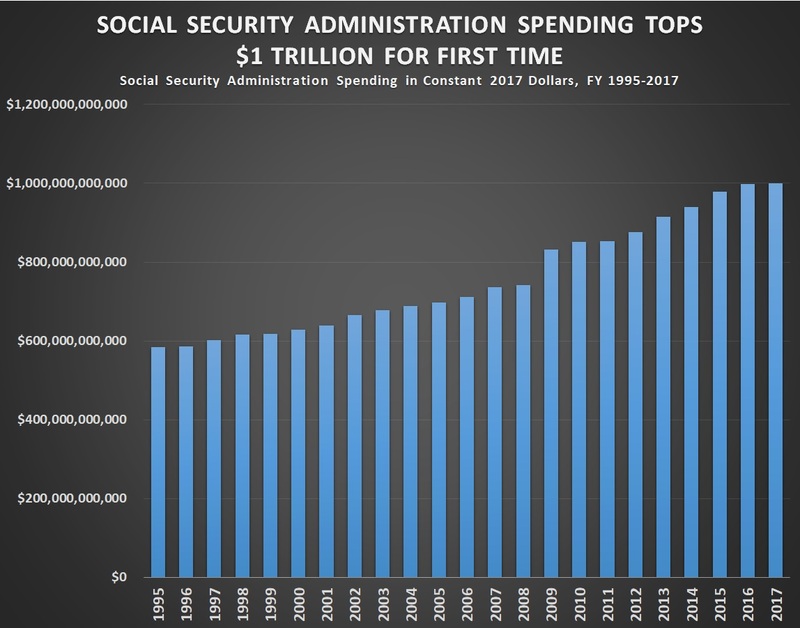 SSA noted that its latest trustees report projects that spending on the Social Security program alone will top $1 trillion in fiscal 2019. This same table in the Trustees Report projects that outlays for the OASDI program will grow to $1,640,400,000,000 in fiscal 2026, according to the Trustees’ “intermediate” estimate.